Israeli club Beitar Jerusalem have announced a change of the club's name to Beitar Trump Jerusalem in honour of the "courageous" American president. The move comes on the eve of the inauguration of the controversial new US embassy in the city, which has angered members of the Palestinian and Muslim communities. In a statement on their official Facebook page, the club said: "For 70 years Jerusalem has been awaiting international recognition, until President Donald Trump, in a courageous move, recognised Jerusalem as the capital of Israel." 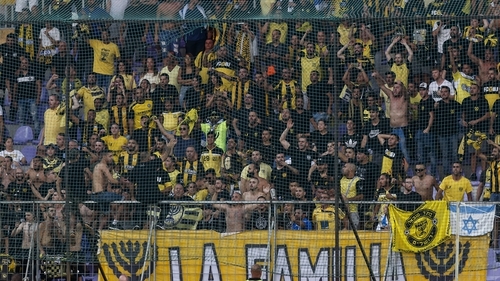 Six-time champions Beitar are backed by a vociferous band of right-wing supporters and are the only leading Israeli club never to have signed an Arab. The signing of two Muslim players from Chechnya in 2013 caused uproar, and when one of them Zaur Sadayev, scored on his debut against Netanya, hundreds of Beitar ultras, known as 'La Familia', walked out. Beitar are currently second in the Israeli Ligat Ha'al, seven points behind leaders Hapoel Be'er Sheva.